Getting the best network performance for Synergy. In most cases, WiFi works great and is very responsive. However, in some extreme cases, the cursor could lag or randomly disconnect. Using Synergy on a laggy WiFi network is pretty painful. One solution to this problem is to use Ethernet, a faster, more reliable and more secure type of network. 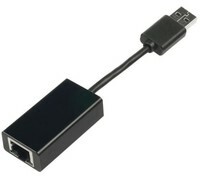 To use Ethernet, you may need to purchase an additional USB Ethernet adapter (most modern laptops don't have an Ethernet port). Also, all options described in this guide require an Ethernet cable (but the final step requires a Crossover Ethernet cable which is a little different), with the exception of Thunderbolt. 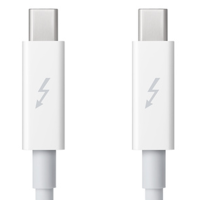 If you're an Apple user, you can actually use a single Thunderbolt 1 and 2 cable to form a network bridge between your computers. In this case, you don't need an Ethernet cable or switch; simply connect your two Macs together with a Thunderbolt cable. We haven't tested Thunderbolt 3 (looks like USB-C), but you're welcome to give that a try. For home users, this is usually the simplest option. Your Internet router usually has a few spare Ethernet ports on the back that you can plug straight into. Of course, this requires a regular Ethernet cable. Sometimes this isn't possible because your router is in another room (and you don't fancy running ridiculously long cables out of your bedroom window). You could purchase a new switch. Doesn't need to be fancy, and you can usually get away with the least expensive one (some can even be powered by USB). Connect both of your computers to the switch using a regular Ethernet cable. After this, you'll need to setup a static IP (see the section at the end of this guide) since you're not connected to your router (which usually takes care of IP assignment). Some people feel that the cost of a new switch seems unnecessary. 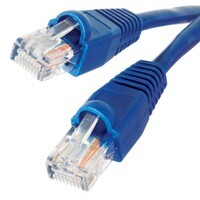 In this case you can simply connect the two computers together with a single cable, but, if you're not using gigabit then it has to be a special Crossover Ethernet cable. Don't let the image below scare you, it's simply to illustrate the difference between regular cables and Crossover cables. You can buy these already made from all major retailers (e.g. Amazon). As with using an isolated switch (described above), you'll need to setup a static IP (see the section at the end of this guide) since you're not connected to your router (which usually takes care of IP assignment). A common issue with Ethernet is that you need to run a physical cable between your computer and your Ethernet switch. For office users, this is often not an issue, since you'll have an Ethernet port in the floor panel. But for home users, it's often a problem; if your Internet router is in another room, then how do you plug into that? You could run a cable between your living room and home office, but that's kind of impractical. Another idea is to have Ethernet cables installed in all the walls, but most people aren't prepared to go to those lengths. 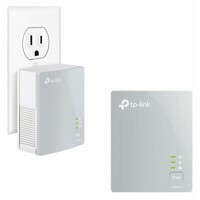 The best solution we've found is to use Powerline Adapters; these will create an Ethernet network out of the existing power circuit in your home. Your Internet router will have something called a DHCP server, which automatically hands out IP addresses to devices on your network, but sometimes you can't run a cable to your router. In this case, you'll need to setup a static IP. If this article didn't help, you can talk to someone on our support team.